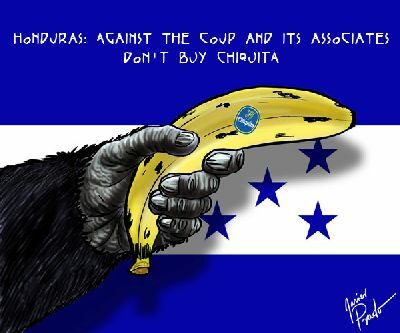 In response to the call made by the National Front against the Coup dâ€™ Etat in Honduras (http://contraelgolpedeestadohn.blogspot.com/2009/08/todos-organizar-el-b...), we ask for your help in the establishment of a PERMANENT WORLD BOYCOTT of the CHIQUITA Company that, behind the scenes, is supporting those responsible for the coup. On June 28, 2009, military commandos involved in the coup dâ€™etat arrested the legitimate president of Honduras, Manuel Zelaya. They attacked his residence with machineguns, kidnapped him and took him to the US military base at Palmerola. The plane carrying the â€œpresident-prisonerâ€ flew to Costa Rica, where he was abandoned in pajamas on one of the runways. It is a military-business coup d'etat, planned by the United States IV Fleet, which buries Honduras once again in its dark past of military dictatorships. All of the international organizations of the American continent, the United Nations, the European Union, etc. condemned the Coup d'Etat and demanded Zelayaâ€™s return to the Presidency of the Republic, out of respect for the will of the Honduran voters. After two and a half months, coup participants are still in power and Zelaya remains outside the country notwithstanding the unanimous condemnation of the â€œinternational communityâ€. This was possible because of the ambiguous and suspicious behavior displayed by the US Government which washed its hands of the matter and passed the buck to the president of Costa Rica, Oscar Ãrias. Rather than a negotiation, it was a trick that let time pass and delayed Zelayaâ€™s return. The goal is precisely to maintain this status quo until November, when his presidential term of office ends, and to avoid the national consultation, a sort of plebiscite, about a possible constitutional reform that could lead to the reelection of Zelaya's Government, that is more sensible to people's needs. So now we have new elections (most certainly manipulated) and the disappearance of the risks implied by a government closer to the peopleâ€™s needs. To put an end to arbitrariness, and to put the gorillas back in their cages, the pressure of public opinion is necessary. Diplomacy has failed, and the intervention of international civil society and consumers is necessary.